Large apartments (60-80 sqm) were obtained in the main building, do respecting the volumes and structure of “houses of the past“. There are three rooms feature with large and spacious rooms, dining room-kitchen and bathroom facilities. 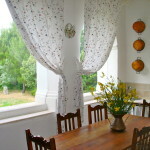 Located on the first floor or the ground floor, all have private terrace or garden, with tables and chairs for outside. 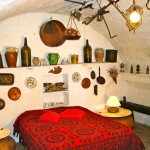 Carefully restored and furnished with old and original family furnitures, they maintain the typical atmosphere of the place and are ideal for more couples of friends or large families. When booking it is possible to choose only an apartment within the 4 available categories (Large, Medium-sized, Small and Special ones), we will do our best to please you.